Even the little things like learning to zip up a coat for the first time with no help, a wiggly tooth, picking up after oneself without being asked, Daddy loading the dishwasher correctly - it all warrants a treat in my opinion. As with most celebrations, a special cake is usually in order. I hate making cake. I really do. It's one of those desserts that made Betty Crocker and Duncan Hines who they are - and I'm extremely grateful. Some 1950s housewife probably got fed up one day after she slaved over a hot stove for 6 hours straight making a seven course dinner for her family and realized she forgot to make dessert somewhere in there, only to have her husband call to say the boss will be coming home with him and she needs to make her famous 14 layer triple chocolate cake because he's 'up for that promotion' and her cake is 'just the ticket' to 'seal the deal'. As if cake has that kind of pow.....what am I saying? Of course it does. While we're on the subject, did you ever notice with old TV shows, the boss was always at one of his employees house having dinner? And the boss was always called Mr. Smith or Mr. Jones? Where was his wife? Oh, I'll tell you where she was. She was in the back of the pantry downing two fingers of scotch straight up, thanking the Good Lord above it was some other missus' turn to play happy housewife for the evening. I just find making a cake from scratch to be so tedious. It stresses me out. First, the cake has to be level. If it's not level, it's just won't taste good. Everybody knows that. Let's not even discuss the frosting. I'm the worst when it comes to the frosting. It has to have the perfect amount of swirls and peaks or it must be completely smooth. Problem with that is I'm completely useless with both methods. Like hopelessly hopeless. 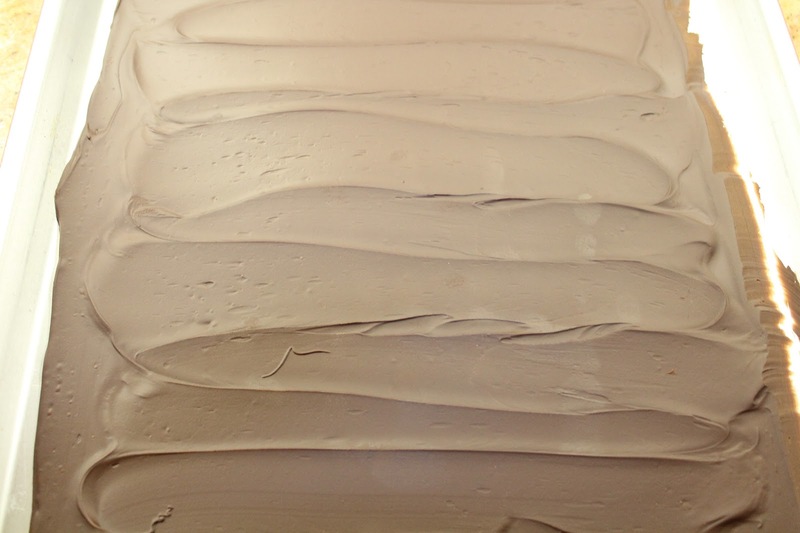 This is why cake mixes and ready made frostings are a beautiful thing. All I have to do is follow the box, pull back some foil seal and voilà. Dessert is served. However, with this cake, I don't have that problem. It's a simple cake, with a simple coating, then covered in melted ganache to cover all my mistakes. Time consuming yes, but the outcome is quite pretty and totally worth the effort. The perfect dessert to make if the boss is coming over and your husband is up for that promotion. Preheat oven to 350ºF. 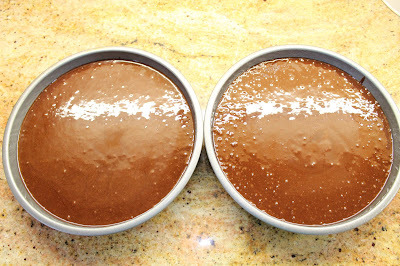 Prepare two 9-inch round baking tins by coating with non-stick cooking spray and lining the bottom with parchment paper. 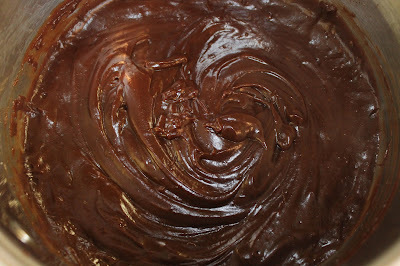 In a medium mixing bowl, whisk cocoa powder and boiling water until smooth; set aside. 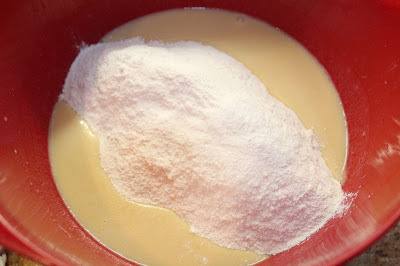 In another mixing bowl, beat eggs, vegetable oil, buttermilk, and vanilla together and beat with a mixer until smooth. Pour dry ingredients into wet and mix well. 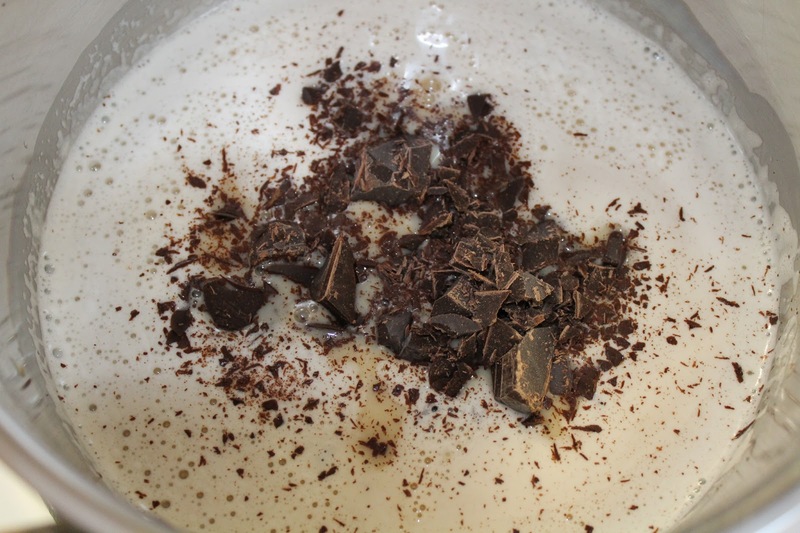 Pour cocoa mixture into cake batter and blend just until incorporated. Divide the batter between the prepared pans. Be sure to tap pans several times to help air bubbles release - and there will be A LOT of them. The pan on the left has been tapped a few times, but you'll see there are still some bubbles. The right is bubble city. 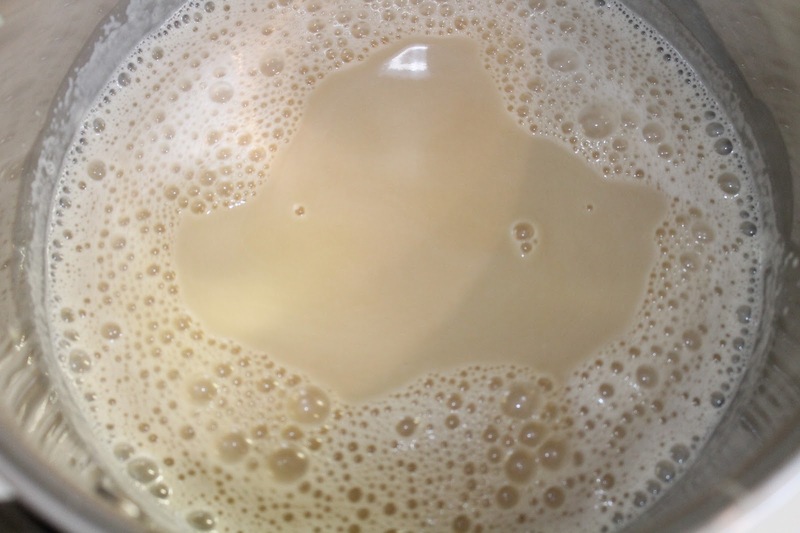 Pour milk into a saucepan and bring to a simmer over medium heat. 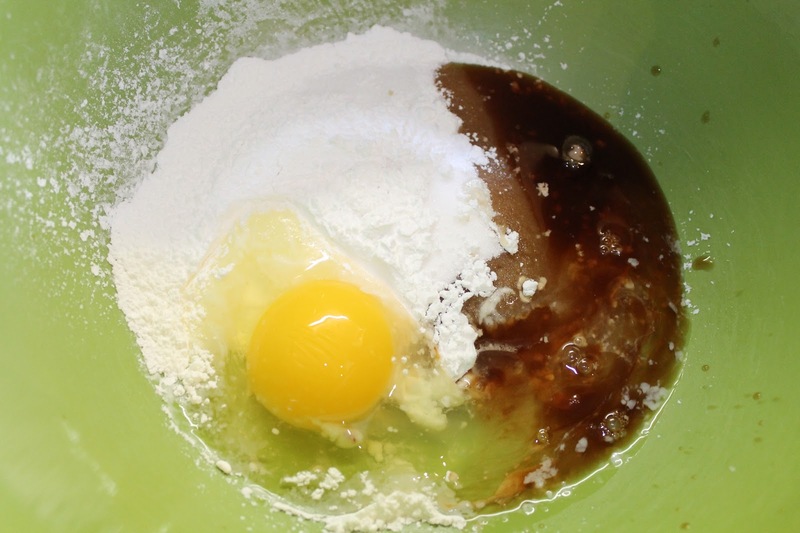 In a heatproof safe bowl, whisk in the sugar, cornstarch, vanilla and eggs until smooth. 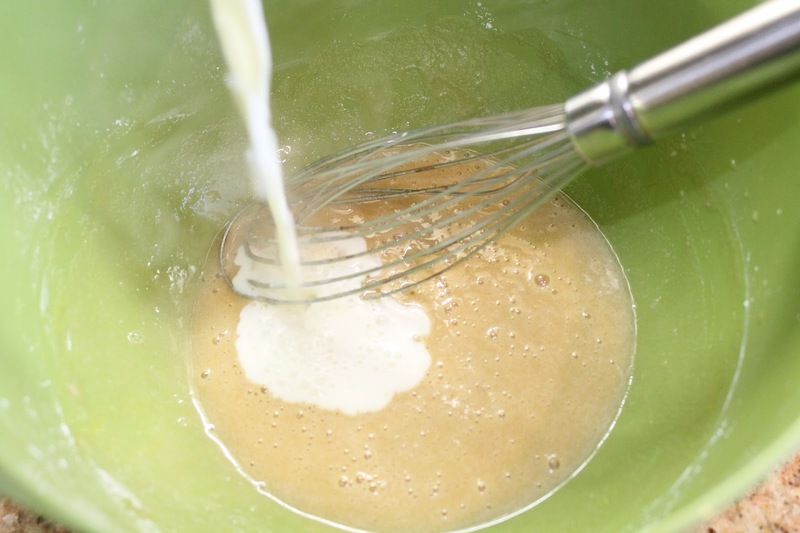 Gradually whisk half of the hot milk into the sugar mixture, mix well, then return entire sugar mixture to the pan with the remaining milk. Add in chocolate. I do it this way because I find it reduces lumps. I don't know why, it just does. 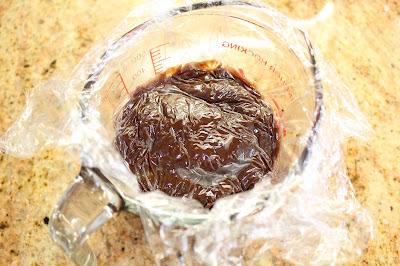 Reduce the heat to medium low and cook, stirring constantly, until the mixture boils and thickens. The consistency should be custard or pudding like. Transfer chocolate filling to a bowl, preferably glass. Press plastic wrap directly onto the surface and refrigerate until cold, at least 1 hour. Place the chocolate and salt in a large heatproof bowl. 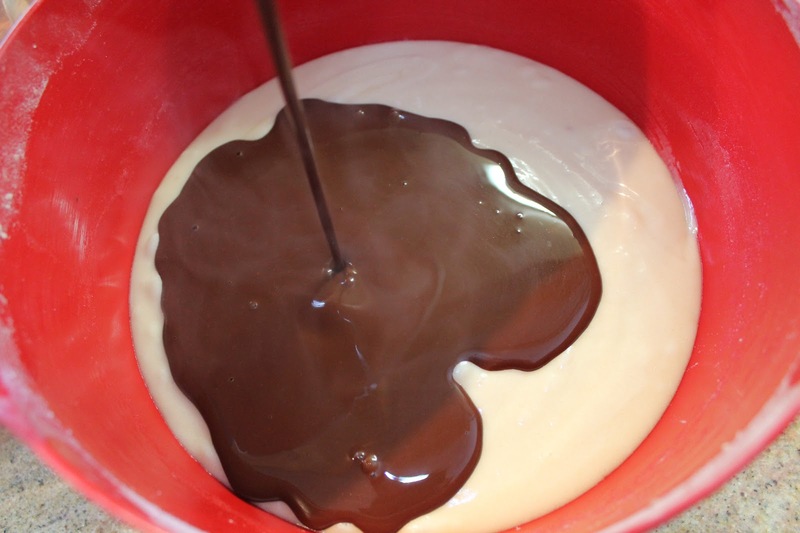 Bring heavy cream to a simmer in a saucepan over medium heat and pour over chocolate. 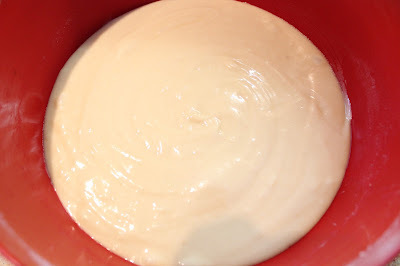 Let it stand for a couple minutes, then whisk until smooth. 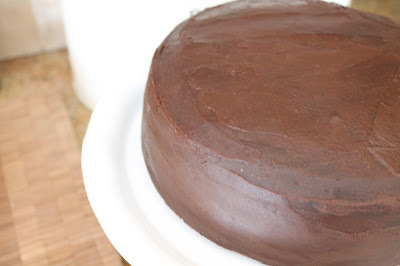 Refrigerate the ganache for about 20 minutes - until it's a bit thicker, but still pourable. Leave out at room temperature. Take the filling and evenly spread over top of a cut portion. 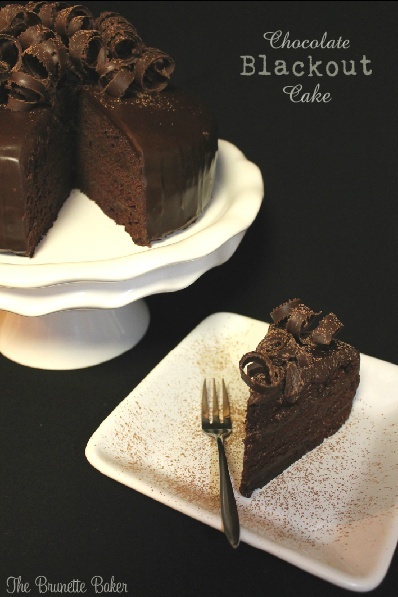 Begin to layer each portion with filling, cake, filling, cake. 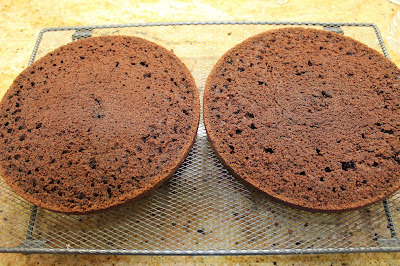 Spread the rest of the filling over entire surface of the assembled cake. Allow to set at room temperature. My advice would be to frost cake on the wire rack. That's where I made the mistake. I frosted mine on the cake stand and I had to move it off to pour ganache. 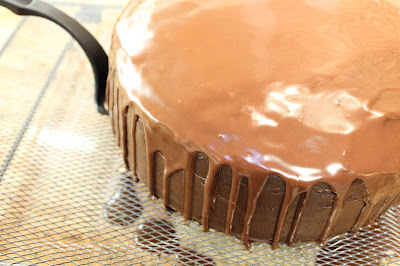 It was fine once the ganache settled because it sealed everything in, but this will save you the hassle from going back and forth. 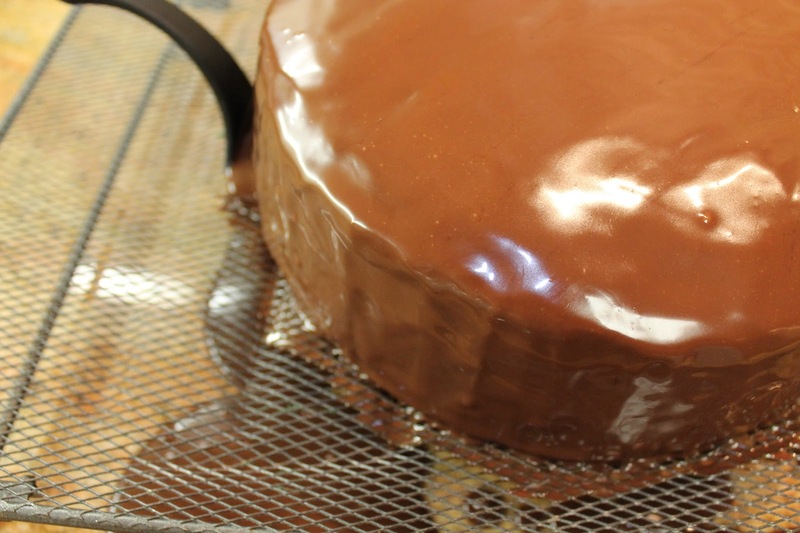 Before pouring ganache, be sure to place something underneath the rack to avoid a big mess. Seriously, I have NO IDEA where my brain was making this cake! 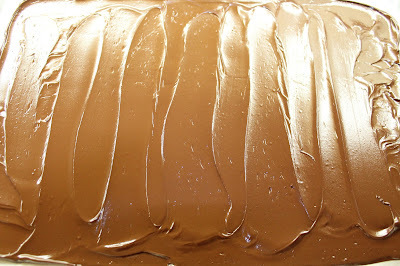 I wanted to make some fun effects on the finished cake, so I poured a little of the ganache to make a stripe-effect first, let it sit for a couple minutes, then poured the rest over entire cake. 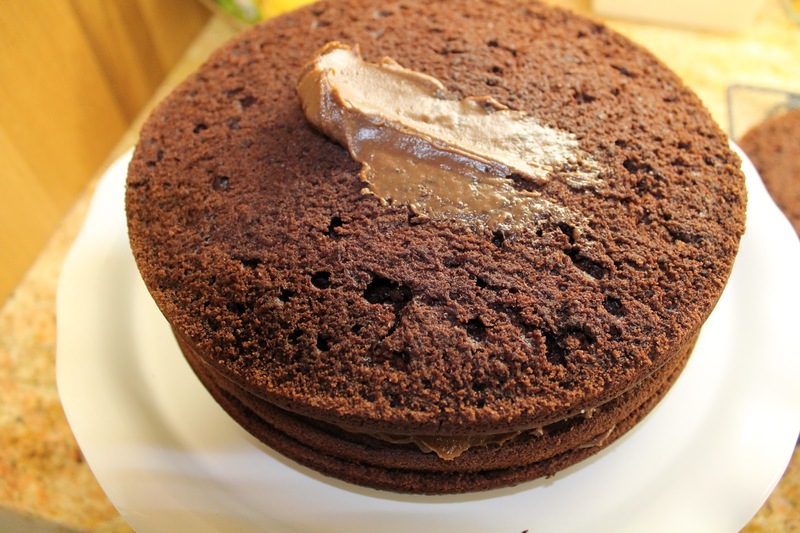 Allow cake to settle before transferring onto a cake plate, taking care when doing so. 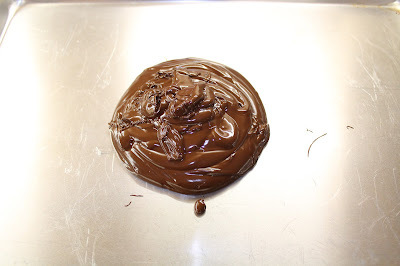 Melt chocolate in a heatproof dish in 30 second intervals until smooth and creamy. Pour onto cookie sheet and spread as evenly as possible with an offset spatula. The thinner the chocolate, the thinner the curls will come out. 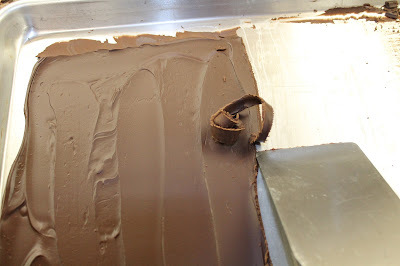 Place tray in refrigerator for about 10 minutes until chocolate has solidified and has turned a matte finish. 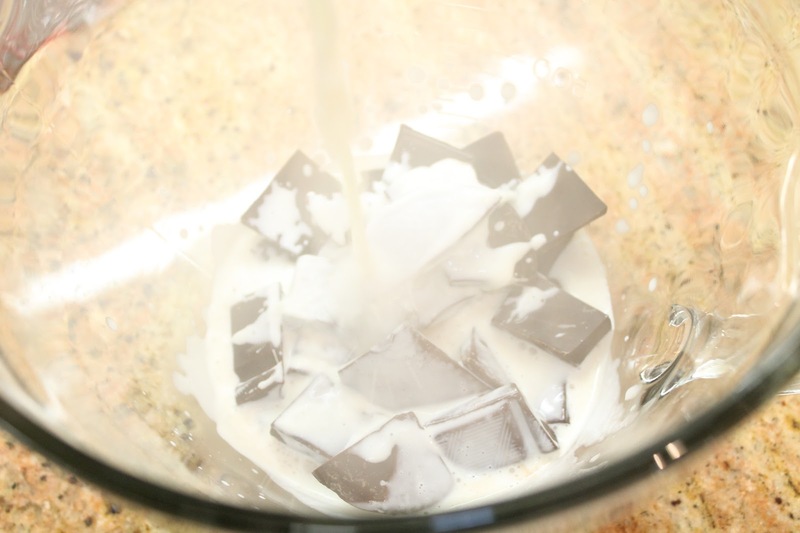 Remove from fridge and allow to sit for about 3-4 minutes until chocolate is pliable. 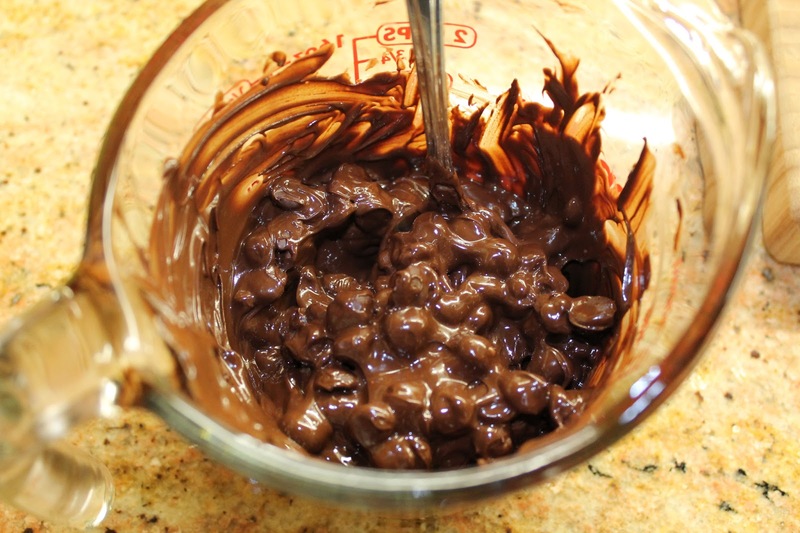 Take the edge of a stainless steel spatula and carefully run it along the edge of chocolate. If it breaks, it's still too cold. You basically want the spatula to glide along the chocolate like new scissors on wrapping paper. 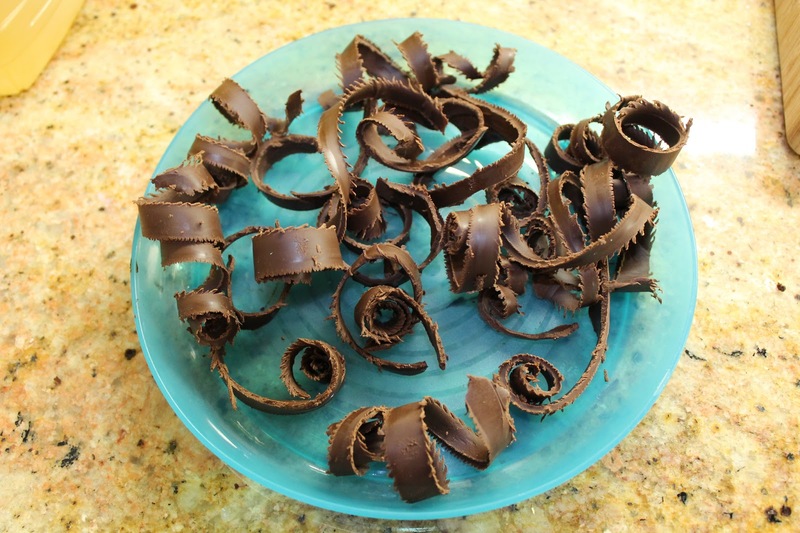 Place curls on a plate or in a dish and refrigerate until ready to assemble. 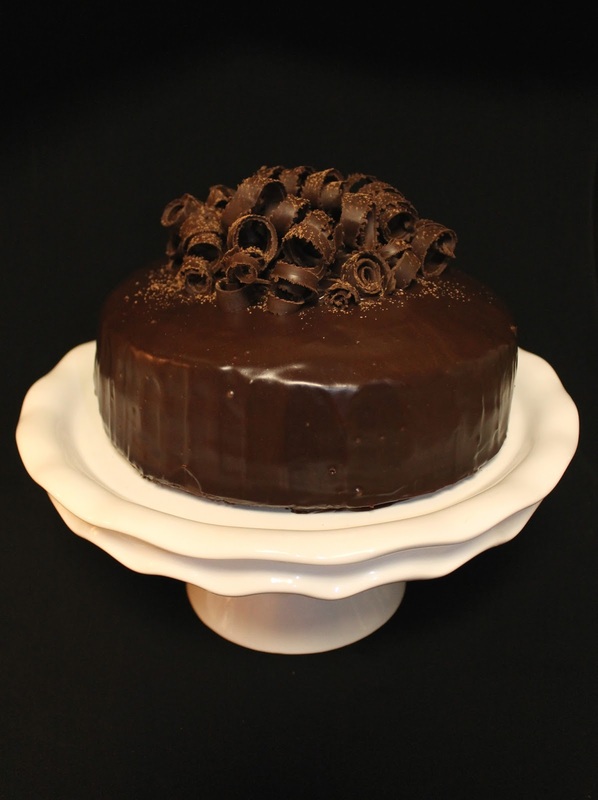 Arrange curls in a heap on top of cake. Dust with cocoa powder once completed. I got tired just reading that, but oh my word it looks like it is worth every minute. And not too bad really, just lots of steps, I will drink through each of them, as to make it faster;p Yummy! This looks beautiful!! Great recipe! Holy cow my mouth is watering. That looks delicious! thanks so much for sharing on Super Sweet Saturday. This looks gorgeous! Beautiful chocolate work. This is the most incredible thing I've seen! I don't know for someone who says that they can't bake or frost a cake from scratch this looks pretty darned amazing! Thanks for linking at Show Me Your Plaid Monday's! Saw your cake featured at Back For Seconds ...this looks incredible!! Pinning...thanks for sharing!! I have to make this cake. today. it looks so good! Yum!